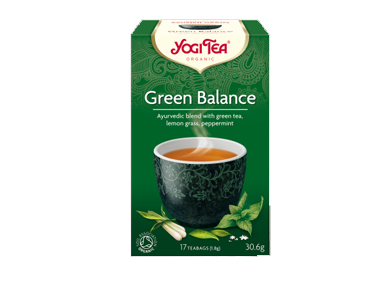 Buy Yogi Tea ® Green Balance Tea - 17 tea bags in the UK from our online shop or directly from our independent Scottish store. If you want to automatically receive an email when 'Green Balance Tea' is back in stock, just leave your email address below. This tea combines the ancient tradition of green tea together with lemongrass, elderflower and fresh peppermint. Yogi Tea ® Green Balance, green tea and kombucha represent the noble Asian tradition of a balanced lifestyle of both the physical body and the mind. This tea combines the ancient tradition of green tea together with lemongrass, elderflower and fresh peppermint to a delicious and delightful blend. The essence of this tea is: ‘Perfect balance’. Where can you buy real Green Balance Tea safely online? If you are wondering where you can buy Yogi Tea ® Green Balance Tea - 17 tea bags safely online in the UK, then shop with us. Green Balance Tea - Yogi Tea ® Green Balance Tea - 17 tea bags in Yogi Tea and Herbal Teas.